The Downtown Business Association (DBA), a fairly new group of merchants and businesspersons, has introduced a great new attraction. In an attempt to appeal to out of town visitors coming to Montgomery and to create an awareness with locals that downtown is alive and well, DBA decided to cash in on something totally Montgomery. What does Montgomery have that is totally unique to Montgomery?Duh, Civil War and Civil Rights. Montgomery was the birthplace of the Confederate States of America in 1861 and the destination of the Selma to Montgomery March in 1965, and visitors come from all over the world to see landmarks connected to these events. So with that in mind, we produced the Civil Heritage Trail (CHT) brochure. Must relate either to Montgomery’s role in the Civil Rights Movement and/or the Civil War. We decided to begin the tour at the Union Station Visitor Information Center since most visitors start their Montgomery adventure there. And since Union Station is located on the Alabama River and adjacent to Downtown’s commercial district, it reflects the heyday of railroad travel which spans both the Civil War and Civil Rights movement. The CHT then begins through the downtown to the attractions listed below. Riverfront Park and Harriott II Riverboat—When cotton was king, daily riverboats loaded bales for sale in Mobile and unloaded goods from foreign ports. Today, the stern wheel Harriott II cruises along the Alabama River. Rosa L. Parks Library and Museum and Children’s Wing – On December 1, 1955, seamstress Rosa Parks captured the world’s attention by refusing to give up her seat on a city bus to a white man. Her arrest was the catalyst that began the Montgomery Bus Boycott in protest of the city’s segregation laws. Court Square Fountain (center)—Auctions of land, livestock and slaves were held adjacent to Court Square. In 1885, prominent citizens placed the ornate statue of Hebe, the Greek goddess of youth and the cupbearers to the gods over the artesian well. Winter Building (southeast corner)—On April 11, 1861, from this building General Leroy Pope Walker, Secretary of War for the Confederate States of America, telegraphed General P. T. G. Beauregard to persuade the Union soldiers to evacuate Fort Sumter. When the Union refused, the Confederate batteries fired on Fort Sumter beginning the Civil War. Central Bank Building (northeast)—The handsome Renaissance Revival Central Bank of Alabama was built in 1855 and was the first to lend money to the Confederate government. Bus Stop (north)—On this corner, on the evening of December 1st 1955, Mrs. Rosa Parks boarded a bus after a long day of working as a seamstress at Montgomery Fair department store on Dexter Avenue. Freedom Rides Museum at the Greyhound Bus Station– Twenty-one young people stepped off a Greyhound bus at this station on May 20, 1961, and were met with such violence that shocked the nation and led the Kennedy Administration to become involved in the Civil Rights Movement. Civil Rights Memorial & Center – Designed by artist Maya Lin, the polished granite memorial chronicles key events in the Civil Right Movement and bears the names of 40 men, women and children who lost their lives during the struggle between 1955 and 1968. Dexter Avenue King Memorial Baptist Church – While serving at his first and only pastoral assignment, Dr. Martin Luther King Jr. began his ministerial and Civil Rights leadership here. This 125 year old National Historic Landmark was the center of the Montgomery Bus Boycott which lasted for 381 days. Alabama State Capitol – The Alabama State Capitol was built in 1847 and served as the first capital of the Confederacy with Jefferson Davis being sworn in on the front steps as the President in February 1861. The Capitol was the culmination point of the historic Selma to Montgomery March in 1965. Its great significance in national history has afforded it National Landmark status. Alabama Department of Archives and History – The oldest state-funded archive and museum in the country exhibits a massive artifact collection that documents Alabama history from the early Native Americans to Civil Rights. First White House of the Confederacy – This 1835 Italianate house was the home to President and Mrs. Jefferson Davis during the first months of the Civil War while the capital of the Confederacy was in Montgomery and, today showcases many of the Davis family’s personal belongings. 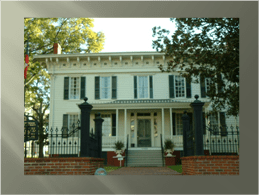 Old Alabama Town – Old Alabama Town is a collection of over 50 authentically restored 19th and early 20th century buildings located within this Downtown area. Many of the historic structures are restored as house museums showing how Alabamians lived in the 19th century. 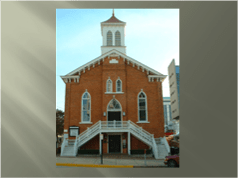 St. John’s Episcopal Church – This handsome Gothic Revival church’s congregation dates back to 1834 and has been the place of worship for many prominent Montgomerians including Confederate President Jefferson Davis. This historic information was laid out in an attractive map format including adjacent businesses along the Trail for visitors to patronize. The handsome brochure was printed and is now available at all sites along the CHT. We then began working with the assorted attractions along the trail exploring ways to actually visually mark the sites on the CHT. We considered various designs for banners, historic markers, and even painted parking meters as well as where to locate the signage. The CHT route had taken into consideration Downtown’s one way streets and parking availability thus allowing for the CHT to be either driven or walked. 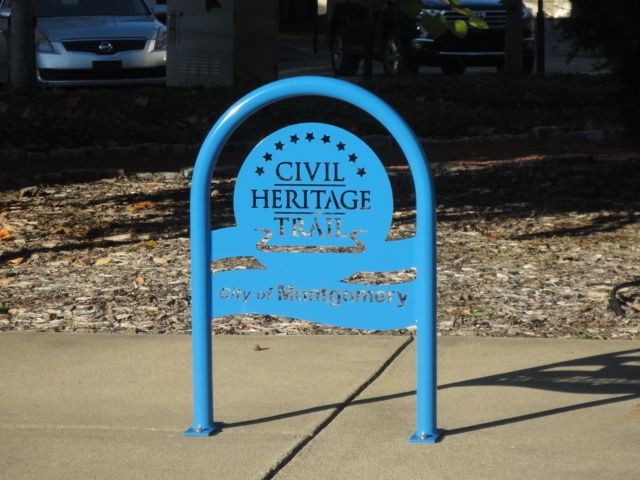 The City of Montgomery offered its support by agreeing to purchase and install bike racks to act as signage designating the trail. The DBA worked with the attractions to decide where to locate the bike racks being sympathetic to the streetscape of their attraction. Look for these unique signs (which double as bike racks) to designate CHT sites. 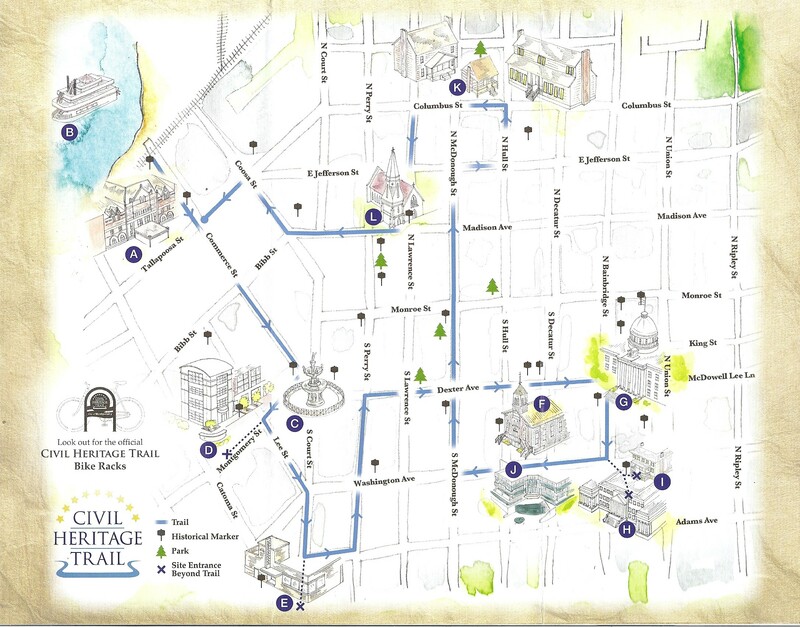 So these nice cool autumn weekend days, grab a copy of Montgomery’s Civil Heritage Trail from Union Station and enjoy our rich cultural heritage on foot or wheel! “First White of the Confederacy”–that’s the label under one of the pictures. Er, ahem, hak-kaff . . . .
Oops. Good catch Jay. Thanks. We made the correction, albeit later than we would have liked due to some travel. We should be back to our regular posting schedule now. So very interesting that Montgomery was ground zero for these two historic events, The Civil War and The Civil Rights Movement. They seem to juxtapose one another, but one thing for sure they both changed our nation in so many ways.